Wet conditions can be challenging to proper hoof care, but it is easy to keep your horse on sound footing even during extensive periods of wet weather. 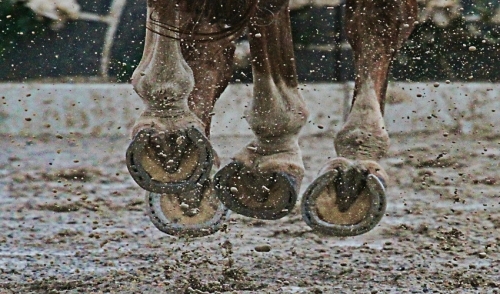 Soft, wet ground can dramatically affect horses' hooves. When the ground is very soft, hooves don't wear down as quickly, and can become overgrown or may grow unevenly. A horse's balance can be affected by soft ground and uneven hooves, which may lead to joint pain, limping or lameness, as well as increasing the risk of falls. In time, knee and hip problems can also develop. If the ground is covered with thick, sticky mud, horses can easily lose shoes, leading to even more gait problems. Loose shoes can also be a problem, with debris working its way under the shoe to cause irritation or infections. Many horses will experience frog sloughing in wet conditions as they lose the callus on the bottom of their hooves. This is natural, but can lead to tender feet, which may affect a horse's temperament. Deeper infections such as thrush can also develop when a horse's feet are consistently wet. Because there are so many problems that can develop when horses are kept in wet conditions, it is important to take steps to minimize excessive moisture and help horses keep their feet dry and sound. Wet conditions can result from many sources, including seasonal rains, emergency floods, poor drainage, leaking pipes or poorly cleaned stalls. Regardless of where the water is coming from, however, there are ways to keep horses' hooves in top condition. Trim hooves more frequently to minimize overgrowth or imbalance. Trims every 4-6 weeks are best, but no more than 3/8 to 1/2 an inch of hoof should be trimmed off at once. Check the horse's shoes daily for any looseness or protruding or missing nails. 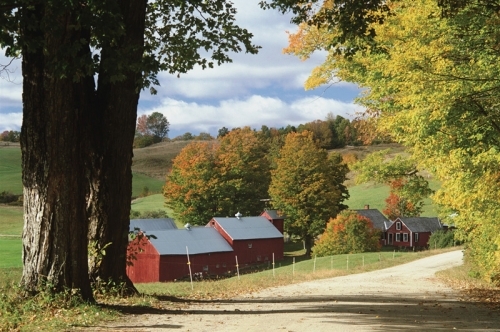 If possible, avoid turning out a horse into any pasture or paddock with thick, deep mud. Use boots as a temporary measure to protect a horse's tender frog or in case of a lost shoe or sloughing, but be sure the boots fit comfortably and securely to avoid stressing the horse. Keep stall bedding clean and dry to prevent any infections. Wood shavings and sawdust will absorb water the best, wicking it away from the horse's feet. Inspect each foot daily, checking for any odor, pain, swelling or discharge. If any of these conditions persist, consult a veterinarian for diagnosis and treatment. Sponge off the horse's legs and feet to remove mud, dirt and debris, rather than using a hose that would force the animal to be standing in mud during grooming. Take steps to improve drainage in corrals, pastures and along frequently used trails, and avoid using flooded areas until they have sufficiently dried out. By providing proper hoof care even in the wettest conditions, it is possible to keep any horse sound and easy stepping.